Matrix / Runout (Run-off groove notation side B): WHERE's MURDER? My favourite album of all time. Something about that track named leave me alone, it is just so good, never tire of that track or this album as a whole even after all these years. First pirated in 1986 but since bought many times on Vinyl, CD, most recently on silver vinyl. Probably a box set to follow after the recent news of the Movement one. 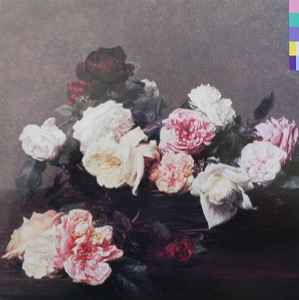 I think Power,Corruption & Lies is New Orders best album by far followed by Brotherhood. Managed to see them Live a few times and Your Silent Face always did it for me. Classic tune. Very underrated album, walks allover Substance etc. The cover says Factus 12 but the record says Factus 10? From the very bass intro of "Age Of Consent", there is a mark of a pleasant starting point for New Order, audibly pretending as if this is the actual debut album of theirs. And partially it may be true. Previously trapped in Martin Hannett's production mould, with "Power Corruption & Lies" New Order do not hide they're finally on their own, free and happy, maybe not entirely singing like a bird (Barney's struggling not to sing out of tune, cute though) but playing like a flock of happy birds to the core, demonstrating the maturity in their sound, song by song heading in different directions. The dark-ish trademark of Morris' drumming and Hooky's stabbing basslines remains intact, but here the structures are more polished and upbeat with a touch of jazz-noir ("We All Stand", which is also dangerously close to the "Advantage"-era Clock DVA) and techno moments ("586", "The Village", "Ultraviolence" and "Ecstasy" all deriving echoes of the group's smash hit "Blue Monday"). "Your Silent Face" is a sad piece with a Kraftwerk-pastiche (the synth melody pleasantly reminds of the latter's "Europe Endless" and "Franz Schubert", in fact possibly a deliberate reference - in "Blue Monday" (and also here, on "586" after a baffling jam-session introduction) they borrowed a bit from the Düsseldorf foursome's "Uranium"). The closing number "Leave Me Alone", melancholic but full of optimism, makes a full circle. Unlike the one-dimensionality of "Movement", "Power, Corruption & Lies" is a downright eclectic affair, conceptually stronger, with a confusing yet iconic sleeve - in Peter Saville's own words, a techno-floral collection, that damn well stood the test of time and in great response to the chosen motif of Fantin-Latour. As far as an early New Order album this one just hits the spot. You get some resemblance of joy Division still with the outbreak of an immerging New order just about ready to break out to the rest of the world. Such a classy and stand out job done in production that it's album cover basically goes completely perfect with the music. A flower in all it's beauty if it were to play instruments might just sound like this album. This is just wonderful. This is where New Order finally left behind the post-Joy Division sound of "Movement" and discovered something all their own. Power, Corruption & Lies is revolutionary. Little like this existed at the time, and even now this LP has something different about it. "Your Silent Face" is great, and "Ecstasy" is brilliant. The Peter Saville cover gives nothing away, which just adds to the album. What looks like a colour wheel on the sleeve back is actually a key to deciphering the codes on the sleeve edges of Blue Monday, Confusion and this release. The outer ring of the wheel represents every letter in the alphabet with the solid bars doubling as numbers 1-9. The solid light green strip pointing "north" represents the letter "A" (and 1) the solid yellow bar to the right is "B" (and 2)and so-on ending with the split bar of pink and yellow for "Z". The first four boxes on Power Corruption and Lies decode as FACT, the last is split into two for the numbers 7 and 5. I personally think this is New Order's best long player - with 'Age of Consent', '586' and 'Your Silent Face' you just can't go wrong for an introduction to THE best band in the world. And of course, it's all produced by Martin Hannett - bloody genius.